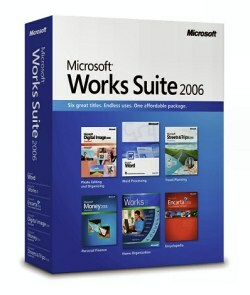 Microsoft Works Suite 2006 is a combination of six great software applications in one affordable package. The six software bundled are Microsoft Word 2002, Works 8, Money 2006 Standard Edition, Digital Image Standard 2006, Encarta Encyclopedia Standard 2006 and Streets & Trips Essentials 2006. These software basically blends word processing, maps, photos and other tools. Seattle Post-Intelligencer tried to use and review Microsoft Works Suite 2006, and found that overall, Works Suite 2006 is suited for people who don’t need much kick and don’t want to buy separate programs for their home needs. People in business and so-called “power users” would be well-advised to stick with Microsoft Office.